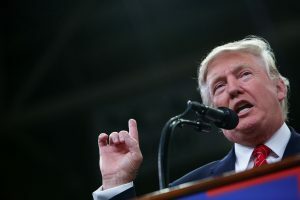 DENVER — Asked Tuesday about the price of gasoline and how regulation may affect the price of electricity, Donald Trump stood up for American’s fossil fuel industry — coal in particular. But the Republican nominee incorrectly blamed the coal industry’s woes solely on new federal regulations, leaving out the effects of cheap natural gas. And he warned those regulations will lead to an imminent spike in the cost of electricity. That’s not on the horizon, at least according to the Department of Energy. THE FACTS: This is not true. The coal industry is the United States is unquestionably going through hard times. A string of major coal companies have filed for bankruptcy in recent years, including Arch Coal, Alpha Natural Resources and Peabody Energy. Layoffs and cutbacks have spread economic suffering through coal country in the Appalachians and Wyoming’s Powder River Basin. But that hasn’t led to a shortage of electricity. Nor has a lack of coal kept the nation’s coal-fired power plants from running. THE FACTS: These are boom times for natural gas extraction, due to a drilling technology that Trump touts often on the campaign trail: hydraulic fracturing, which is better known as fracking. In fact, advances in extraction driven by hydraulic fracturing has led so many energy companies to pull so much natural gas out of the ground that they have flooded the market, depressing the price of natural gas and making it harder for those companies to turn a profit. In that way, they’ve been a victim of their own success. In May 2016, the last month for which data is available from the Energy Information Administration, the use of natural gas to make electricity increased from the previous year in every part of the country, save the western U.S. There, warm spring temperatures led to snowmelt that boosted hydroelectric power generation. This boom in natural gas has hammered the coal industry, which hit all-time peak in profits in 2008 — before wide-scale use of fracking made it cheaper to generate electricity using natural gas. Many U.S. coal companies also spent big in the past decade, betting on increased demand in Asia. But they have been largely unable to sell as much as they need to overseas to recoup their investments, helping tip several into bankruptcy. Still, President Barack Obama’s administration has implemented a series of rules that aren’t making the coal industry’s life any easier. Obama last year required coal-fired plants to cut their carbon emissions and earlier this year placed a moratorium on sales of federal coal reserves. In 2011, the Obama administration required new emissions controls for coal-fired plants. And some states and localities have tried to limit fracking; New York State’s Democratic governor banned it altogether last year. Those are the kind of regulations Trump is complaining about. And some experts do say the coal regulations could create issues for the already-wounded industry in the future. THE FACTS: That’s certainly possible, but the Energy Department is predicting a more modest rise — as much as 3 percent next year. The reason? A slight decline in the projected use of natural gas for electricity generation and a slight increase in the projected use of coal. In the meantime, the cost of electricity is falling — down about 2 percent over the past year, according to the Energy Information Administration — due largely to the cheapest price for natural gas prices in decades.